With 450-liters (15.9 cubic feet) of trunk space, the FF has ample room for four passengers and their luggage. GENEVA (Bloomberg) – Ferrari S.p.A., Fiat S.p.A.'s most profitable unit, will target wealthy families and golf bag-toting sports-car enthusiasts when it introduces the four-seat FF, the first Ferrari with four-wheel drive. 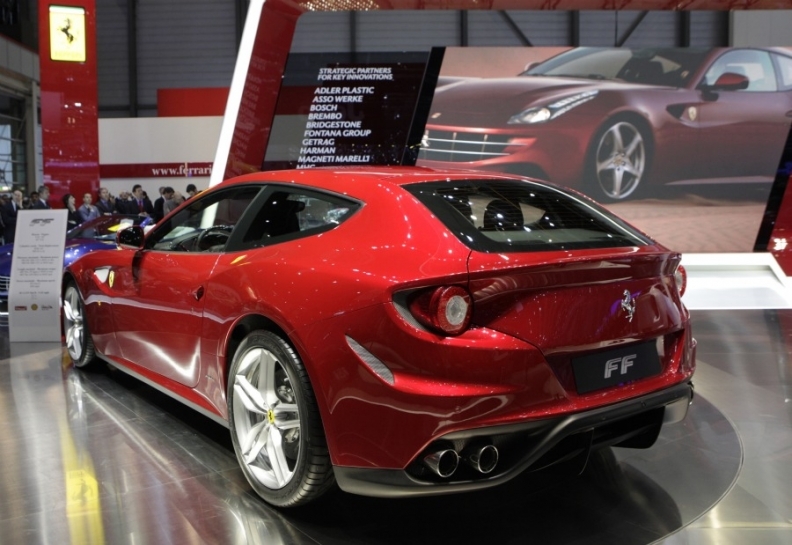 The car, launched today at the Geneva auto show, will be priced at 260,000 euros ($359,000), Ferrari said. The 660-horsepower FF, which stands for Ferrari Four, accelerates to 100 kilometers (62 miles) an hour in 3.7 seconds. "Four-wheel drive is a revolution for Ferrari owners," said Fabio Barone, 38, chairman of the Passione Rossa owners' club, who owns two Ferraris. "You can finally drive a real Ferrari, with its extreme performance, to take your family skiing." Supercar sales are growing amid renewed optimism in the finance industry after the U.S. economy expanded 2.9 percent last year, the most in five years. U.S. sales of the world's most expensive cars, a category that includes Ferraris and spans sticker prices from $200,000 to $400,000, may surge 146 percent this year after dropping 40 percent in 2010, according to Lexington, Massachusetts-based IHS Automotive. The FF is "a different Ferrari for different Ferrari owners," Chairman Luca Cordero di Montezemolo said at the car's introduction to clients and dealers, webcast on Feb. 23. "This is a Ferrari that can be used for families and for long trips." The FF "can comfortably accommodate four people and their luggage," with a 450-liter (15.9 cubic feet) trunk, extendable to 800 liters with the back seats down, more than many sedans, Ferrari said on its website. The trunk and cabin space are the biggest in the category, according to the company. "Ferrari is widening its offer to niches it didn't cover before," said AT Kearney analyst Marco Santino. "It may be a winning strategy if they are bringing something really new to the market." Lamborghini S.p.A., Italy-based Ferrari's main competitor, has used four-wheel drive technology already. Lamborghini unveiled its Aventador supercar at the Geneva show. The car will be the carmaker's most powerful series production vehicle ever. The Aventador, which has an engine that surges to 100 kilometers per hour in 2.9 seconds, will replace the Volkswagen AG brand's top-of-the-line Murcielago. The supercar, priced at $370,000, is already sold out for its first year of production, a person with direct knowledge of the plan said last month. Ferrari in 2010 posted a 13 percent increase in sales in the U.S., the biggest market for supercars. Employees at big Wall Street banks continued to outpace other professions in earnings even as they took modest pay cuts in 2010. Ferrari is also trying to boost profit by adding products and expanding in fast-growing countries such as China, where its sales increased 44 percent in 2010, and India, where it will open a first dealership in Mumbai in coming months. Ferrari opened a theme park in Abu Dhabi last year. Fiat has said it may consider selling a stake in Ferrari to raise cash. "Ferrari is a significant repository of value," CEO Sergio Marchionne said Jan. 27 on a conference call with analysts. "We've made no commitment about executing a partial divestiture strategy or retaining our current shareholding" in the company, he said. Ferrari "is the prize asset of the new Fiat auto, with high margins, high growth and a unique brand value," Max Warburton, an analyst at Sanford C. Bernstein in London, wrote in a note to clients on Feb. 2. He estimates that Ferrari and Fiat's Maserati brand may be worth a combined 3.5 billion euros. Ferrari's earnings before interest, taxes and one-time items, which Fiat calls trading profit, rose 27 percent to 303 million euros in 2010 as revenue reached 1.9 billion euros. Fiat's auto unit began trading separately from the company's industrial operations on Jan. 3. Marchionne in April announced a five-year plan for Ferrari and Maserati, calling for the two luxury brands to almost double revenue to about 4 billion euros by 2014 by adding products and widening their model ranges.